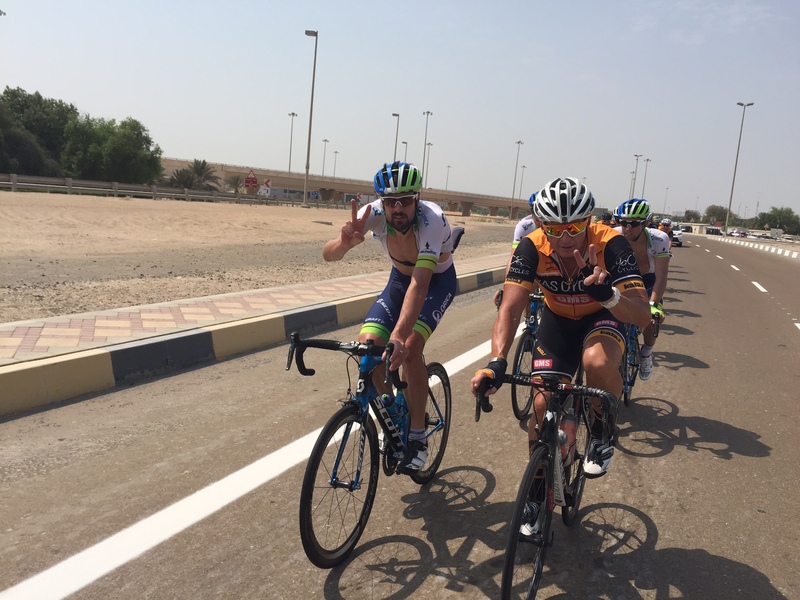 Life in the U.A.E and a bit of cycling – It never gets easier… you just go faster! It never gets easier… you just go faster! If you’re a cyclist and come to live in Abu Dhabi, you might expect the same sort of options you might get in Europe, Australia etc, where a city of a similar size might have multiple ride options, different clubs and a variety of routes. You’d be very wrong. No clubs, no bike paths a poor road infrastructure hugely limit your options, down to 4. 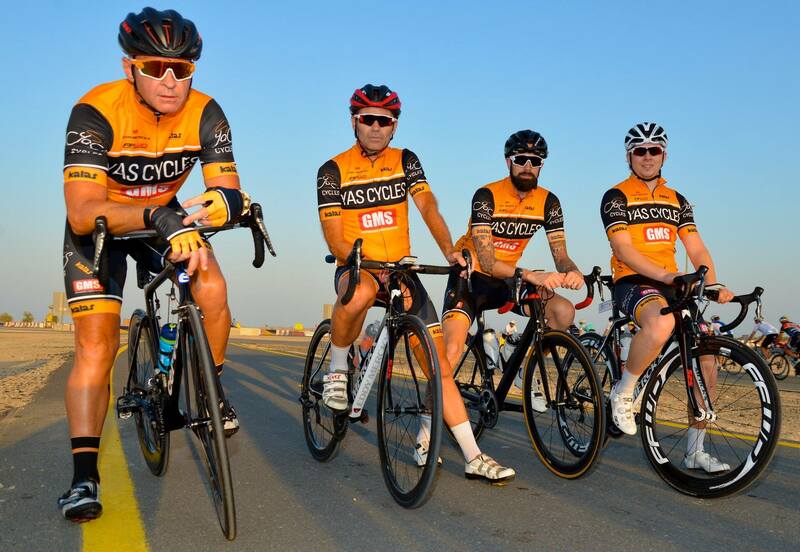 If you’re a social rider, or just like pedalling, the Raha group is for you; if you are used to a competitive ride, the GMS-Yas team is your option; option 3 is solo on the big highways; or you can drive out to option 4, the 100km closed cycle path at Al-Wathba. Having done all 4 options, there is a definite time and place for each. I mean every rider likes a social now and again, or a solo ride, as much as they do a competitive spin. This blog is on the GMS-Yas ride. Each Friday at 5.30am in the summer, or 6 in the winter, anywhere from 10-30 riders meet for what can be commonly termed as the smash fest. Depending on the weather the level of hurt changes – summer being a killer in the heat but a more sociable pace, winter is a big ball swinging exercise that can often not be for the faint hearted. Distance will be anywhere from 100km to 160km with the average pace low 35km\h in summer to 37km\h in the winter; frequently travelling at over 45 is not unknown. The standard route is out to a petrol station on the main Abu Dhabi to Dubai highway, not very inspirational or picturesque, but the coffee is ok.
We start with a steady build up for about 20km out to the new highway at the back of Al-Falah, a relatively new development, and then on to a brand new 5 lane highway to Dubai. Now begins 16k of through and off, ramping up to 50+km\h, and a final sprint on a downhill 60km\h leadout – if you haven’t got an 11, or fast spinning legs, you are not even going to get to sprint! This 16km section can be so hard that your group of 20 at the start can be reduced to 4-5 doing the chaingang and, realistically, just 2 or 3 in with a chance at the sprint. We have a regroup after the sprint and then move onto phase 2 of the ride out – normally about 5km of chill and then its back into the through and off. In the summer this is generally another 16km, but its steadier and the final sprint for the ADNOC is more relaxed. In the Winter, its a whole new ball game – you are probably looking at 30km of through and off before the sprint, a very painful experience, the best part of 80kms before the coffee…. there are easier races! The coffee break is always welcome! The return home is always shorter, always headwind and always harder. The tiredness from the outward section can really bite on the way back, the through and off is shorter but more intense for it, and we have proper echelons – it’s just a brutal section. There are 2 sprints, one after the echelons and headwind section and then the final sprint, which tends to come to the boil as we reach the last 3km as we have a small bridge which is a launchpad for the push for the end. The final km’s from the sprint back to the start point and coffee are very slow! A little bit about the riders… we are a solid group and have been riding together for a long time, so the strengths and weaknesses are well known. When new riders come along they really have to click in and integrate fairly quickly – if you show competence and ability no problems, if you lack a little bit, then you are in for a quick education session, but everyone gets there in the end. Like all good club rides, you have the strong guys, the savvy guys, the old wily foxes and of course the stalwarts, without whom it would never exist. Luckily all egos are left on the road, the coffee breaks are chilled and no hard feelings harboured…generally! 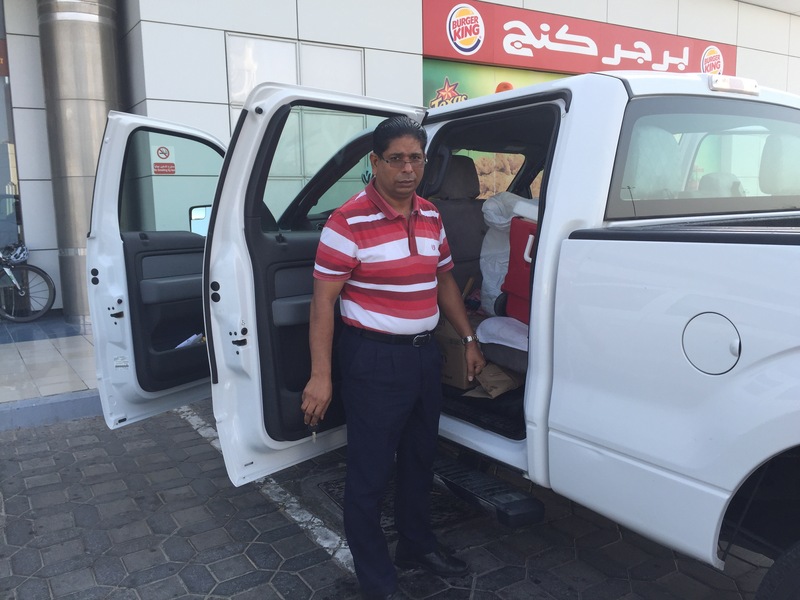 And finally… we are ably supported by our support driver, Majid, there is always a seat available for the riders that need to bail – he even has his Kerala disco for you waiting. Its hot in the Desert, that’s not rocket science or an unknown fact, its also very wet, humid, (more of that later), that general advice is don’t exert yourself too much, stay inside and stay hydrated. So what do I (and many other fools) do in the summer, we carry on cycling. Not the cleverest activity, it must be an age thing and the senility! What that means is 5am wakeup calls or ealier, get the ride in and be home for 9am, and if you think that means avoiding the heat, you’d be wrong, its frequently above 32 degrees at 5am and 9am is usually the 40 degree threshold and the humidity is a killer at that time of day. The humidity can be frequently above 70%, which means that you sweat just thinking about sweating and 2 pedal strokes into the ride you are already drenched, hydration really is a matter of life or death out here, 1000-1500ml of water per hour is norm, – certainly the difference between completing the ride on your bike rather than in the support car! As for training, not really something that I’m into during the heat, riding the bike consistently is the key, keep the fitness at a reasonable level so that when the temperature finally drops, training can begin and the form can pick up. Cycling clothing is something that we can all disagree on, what works for one, is not for another, for the past 2yrs I’ve been using Casp Clothing (www.casp.cc), the fabrics, fit and style just work for me, its not about being the lightest, most breathable etc, in this weather you need comfort and something that dries quickly, both of which Casp does – but you still never get used to wringing your socks out from the sweat! That’s how to get through a UAE summer on the bike. What to do, how to train, information overload? 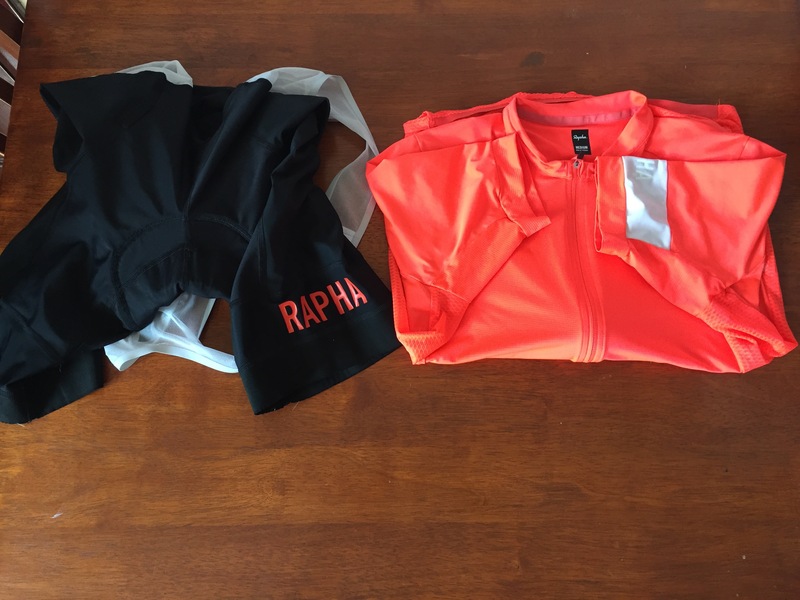 Training… A word that all cyclists like to dwell on. If a cyclist tells you he is not training, he is hiding something. If he tells you he is training, he is also hiding something – so you just accept all cyclists are training for something… whether they tell the truth of what its for, that’s the real conundrum. As with all sports, how you train is the basis of everything that you do. what are you training for? What is the end goal? Cycling, being a time based sport, has its fair share of armchair experts, and also true experts, all trying to tell you how to maximize the time you have, or as the saying is ‘get the most bang for your buck’. A quick Google search and you will have more than enough information to be fully informed on how to spend your crucial time – and more importantly be totally confused! So what do you do? Spend some money on a coach or a training plan? Being spoon-fed your training regime is perfect if you are disciplined enough and don’t enjoy riding your bike (my theory is that people who get on their bike and follow a prescribed program to improve are not actually enjoying cycling or being cyclists, they are simply fitness enthusiasts using the bike as a tool – fine if that’s what floats your boat, but please… you are not a cyclist!) Alternatively, do you take bits and pieces of information and make it up as you go? Most people go for the second option and end up improving, even though they feel they should be aiming for a more regimented approach. Just the same, those taking option 1 end up improving too. As for me, I’ve done both options and here’s what I have found out. Having a plan is great – it gives you building blocks to work on. Not having a plan is also great – it gives you no building blocks, but also no restrictions and you can just ride your bike – which is why I cycle anyway. So I’ve now ended up with a happy balance; structured sessions from a training plan which i know works for me, but also time to just ride my bike with my buddies – surely the most important cycling you can do! Have a little bit of both of these in your life, and you’ll be just fine. For those that of you that know me, you will have seen a dramatic change in my body shape over the past 4 months, the loss of 10kgs does that to you. I thought I’d share the experience from my perspective. 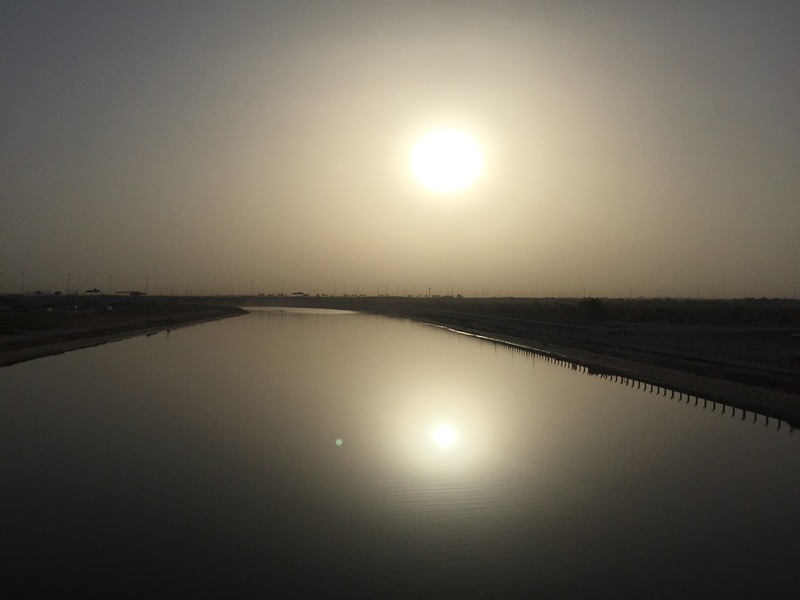 I can go back to June 5th, this was the beginning of it all, a particularly nasty day here in the UAE, which I decided to ride my bike twice on. It came about as the morning ride was made extremely hard by exceptional heat, wind and humidity, I turned back from the group ride, went home and slept. In the afternoon, the humidity and wind had gone, so I decided a sunset ride would work. On such days are your future plans settled. It transpires that a diet of energy gels and sugary based drinks, electrolyte drinks, re-hydration on this particular day of more electrolytes, energy foods and sugar as I was feeling drained from the morning ride, was my un-doing. Unknown to me, I had damaged my intestine, unfortunately I then had a 2 week business trip to Saudi (not known to be the food capital of the world), where all the food I could eat was causing more damage to my intestine. I cannot tell you how ill I was on this trip, but I knew something was seriously wrong. Diagnosing this is extremely hard, the Doctors in the UK called it a Leaky Gut, perforated intestine etc, something that can heal over time, but it requires a change in diet, its the ultimate detox. Out goes sugar, caffeine, gluten, lactose, starch, dairy and in comes, well not much. You just end up scouring the shelves for gluten free, dairy free products and of course natural fruit and vegetables, but being careful to avoid fructose. A change of diet this big, removes carbohydrates from the food chain, and thus making cycling or any exercise really hard. Immediately, I felt a lot better, but just a little dairy or sugar or gluten could ruin my day, so it became a full on job to monitor what I was putting inside me. The cycling suffered, I couldn’t ride for more than 45 mins, I ended up being helped home by fellow ride companions – or cajoled to the closest cafe where I could at least have a decaf drink or something of substance. Then I discovered dates, and some research was done, 2 dates is the equivalent of 1 gel for cycling, so pocket fulls of dates became the norm, the electrolyte drinks, replaced with water, and all of a sudden I could ride my bike for more than 1 hr, Cycling is achieved on dates and water, I have some fruit at the cafes for a bit of extra sugar, but its all naturally healthy, a 3hr ride is still challenging as dates just don’t provide the long term energy needs, but as my fitness returns, its all getting a little easier. Where am I at now, well I’m still on the diet, my blood results showed just a lack of iron now, so Folic acid is required, I’m just starting to add normal food back in, bit caffeine here and there, some bread occasionally, don’t think I will ever go back to the full normal diet. I have to eat pretty regularly but that’s about the only issue now. I have to thank Zoe for helping me get through this all, her support with the diet has made it all so much easier. Here is a sample of what my diet contains. Lunch – Gluten free bread, nut butter, meat, fruit salad and Greek yoghurt. Dinner – Meat/ fish and vegetables, no potatoes. Snacks – Dark Chocolate (80% cocoa min), Dates (made into snack bars with gluten free oats, nuts), Probiotioc drinks, Gluten free oats for porridge, sweetened with maple syrup. Drinks – Water, Caffeine free tea and coffee. 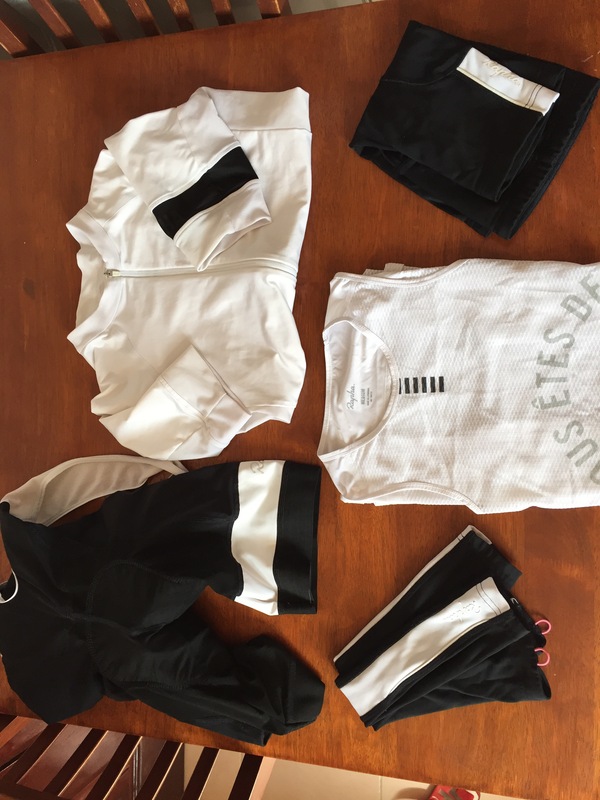 Cycling in the UAE presents a few challenges, we all know about the heat, humidity, wind and traffic but the most important one is dressing correctly. If you’re in the Northern or Southern Hemisphere, then the distinct seasons mean you can have the full range of cycling clothing at your disposal, from warm winter clothing to nice summer best kits and then full wet weather ensemble, for us, living in the desert, where we do get some seasons – just not to the extent of the rest of the world – dressing correctly is one of THE most important decisions you can make. Autumn/ Spring, November – Early Jan and then Mid Feb – May, early morning temps, low 20’s, ride finish high 20’s, low 30’s. 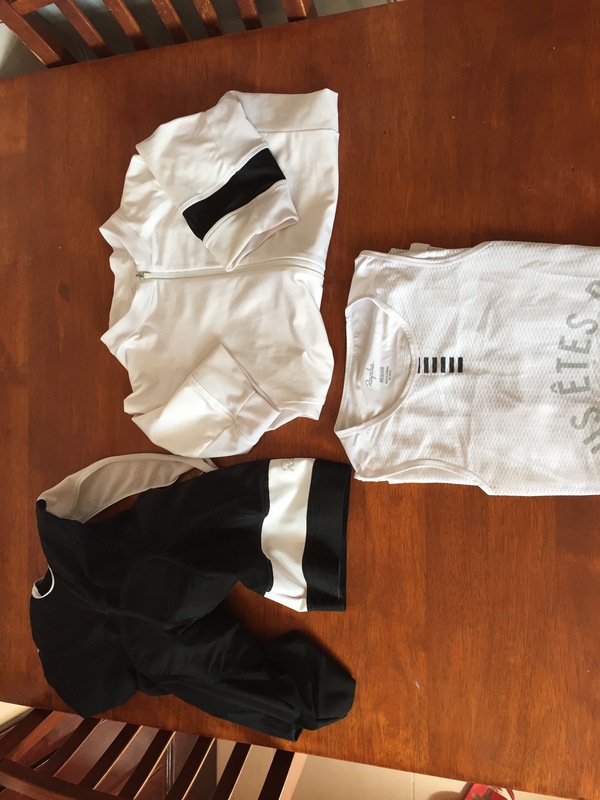 Added a base layer to the Summer gear, and will use a slightly thicker jersey. Will leave the house with Arm Warmers and Knee Warmers on, as the temperature drops to mid-teens at 6am, will be up to mid-twenties by 10am. So there you have it, not particularly scientific but a good indicator of the clothing requirements for cycling here, in my experience I’ve found that normal weight clothing is just too thick for riding in, except on the coldest days, I had to change my full wardrobe when I moved out here as my UK kit had me sweating like riding in a wetsuit! After last weeks social post with the World Tour Professionals, a little update on the other side of cycling life here in the UAE. Today was the monthly Emirates Road Club Team Time Trial at the Al-Quadra cycle circuit outside Dubai, in its one lap layout you have 49km’s of desolate windswept tarmac through the desert. Over the past year, I have gotten in the habit of riding for an ‘Old School’ Team for whichever team I am riding for, by ‘Old School’ we mean normal road bikes and helmets, no Time Trial specific equipment, mind you with deep section wheels, aero road frames and aero road helmets, we are pushing the boundaries of ‘Old’ School cycling to the limit. So, at 0650, our hour and a bit of pain begins.. The race report can be summarized as:- Started smoothly, picked up pace, Batman punctured, Gulp, down to 3, 30km to go, James suffering, I’m suffering, Joe’s suffering, 15km to go, headwind, uphill…. slowing, stars, finish.. Thank you. Not much more to add to that, was it fun, now its over, of course it was! Redemption will be next month, when hopefully all of us will get round. It began with a text. Hi Ian, I would like to invite you tomorrow on the ride with some pros…..
As you can imagine, it didn’t really take me much convincing. So at 945 next morning, we met at the local shop and rode to Yas Marina F1 Circuit to meet up with some pros.. This turned out to be Tom Boonen and his Etixx Quickstep team, and Phil Gilbert and BMC riders – both past World Champions and right at the pinnacle of the sport. 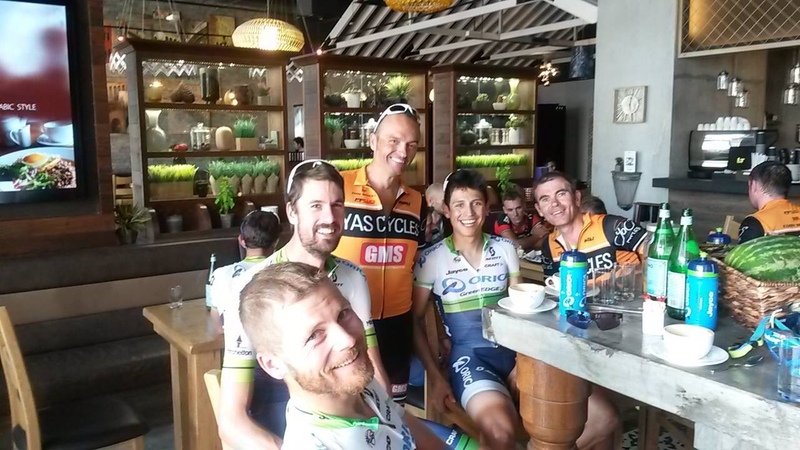 Whilst we are waiting, one of our group happens to talk to a rider on the Orica-Greenedge squad, so before we know it we have 3 squads riding with us, 2 World Champions, 1 x Olympic Medallist, Sam Bewley and 2 of the hottest prospects in the sport, Michael ‘Bling’ Matthews, 2nd in the 2015 World championships and the revelation of the 2015 Vuelta (Tour of Spain) Esteban Chaves. Then the call is made for the ride to begin and for me to lead the route – no pressure, its decided that 50km’s would be enough and so we settle into a tried and trusted route for me. Before I know it, we are just a group of riders, enjoying the pleasure of being on the bike, there is the chatter of the group, you would not know that we have a mix of World stars and local cyclists just pedaling. This is why cycling is GREAT. What other sport allows you this access and opportunity. As we approached the end of the ride, there was the usual question of anyone for coffee – not something I think cyclists ever turn down, so what went from being a ride with the pros – ended up being a ride and coffee. L-R Christian Meier, Sam Bewley, Justin ‘Danny’ Dance (Yas Cycles local like me), Esteban Chaves and me!